Far-right presidential candidate Jair Bolsonaro said Thursday his campaign has no ties to former White House strategist Steve Bannon, contradicting claims by one of Bolsonaro's sons. Bolsonaro, who won the first round of Brazil's presidential election Sunday and is the front-runner in polls for the Oct. 28 runoff, was asked about connections to Bannon during an event in Rio de Janeiro. Bolsonaro said that if his son Eduardo Bolsonaro had met with Bannon, "he didn't tell me about it." 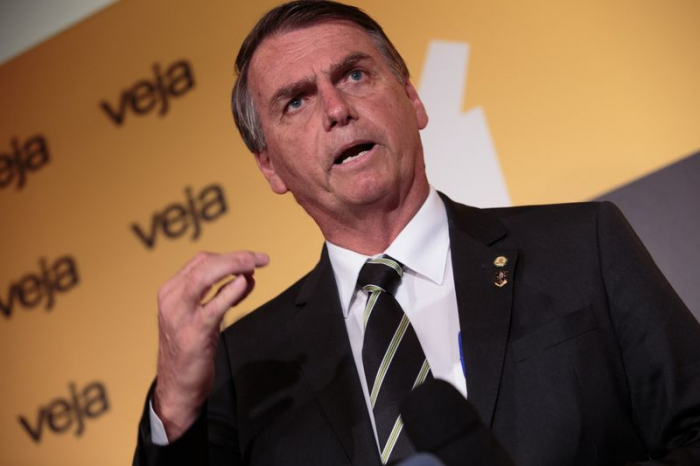 "We don't have the resources to pay for the campaign ... even if (a marketing strategist) approached us," Bolsonaro said. He described the reports of connections to Bannon as "typical fake news." In August, the Brazilian magazine Epoca quoted Eduardo Bolsonaro as saying Bannon "had put himself at our disposal to help." In the interview, Bolsonaro said the help would not be financial, but rather "internet tips, sometimes an analysis, interpreting data, those kinds of things." Also in August, Eduardo posted on Instagram a picture of himself with Bannon. The caption said that the two had met and that Bannon was an "enthusiast" of his father's candidacy and they would "unite forces against cultural Marxism." Bolsonaro, a former army captain who speaks approvingly of Brazil's 1964-1985 dictatorship, will face former Sao Paulo Mayor Fernando Haddad of the leftist Workers' Party in the runoff election. At the same event Thursday, Bolsonaro said that he "admired Trump" when it came to his tough stand on immigration. "We can't have a country with wide open borders," Bolsonaro said.